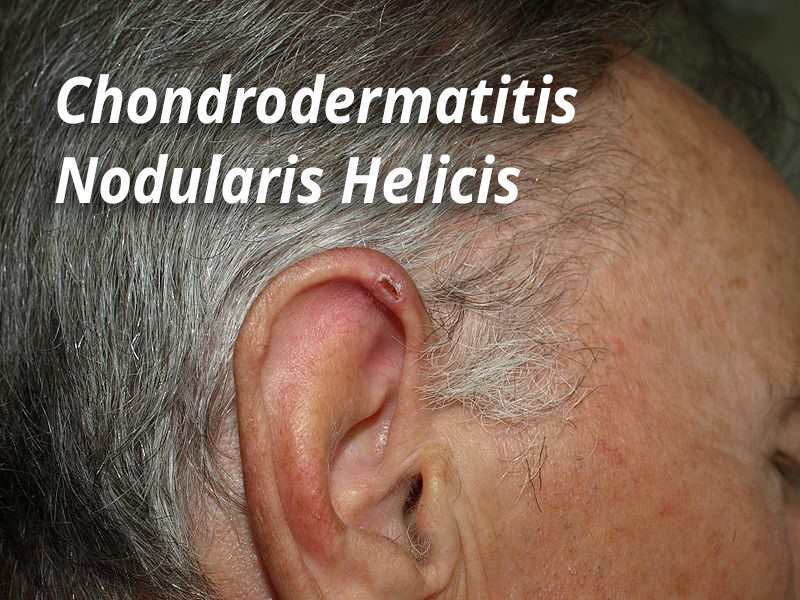 A chondrodermatitis nodularis helicis (CDNH) is a painful but benign growth on the ear that is the result of chronic pressure, usually due to sleeping on the same side every night, which results in reduced blood flow to the area. Cold temperatures can play a role in its formation and can aggravate an existing lesion. This condition is most common is elderly men, but can appear on women and persons of any age. It appears as a red bump on the helix or anti-helix of the ear and often has a central ulcer or scale. These characteristics can make it difficult to distinguish from squamous or basal cell skin cancers – your dermatologist may need to perform a biopsy to establish a diagnosis. The first line of treatment for CDNH is to relieve the chronic pressure that resulted in its formation. Some medical supply stores sell special pillows with a hole in the center that allow a person to sleep on their preferred side without putting pressure on the ear. A similar effect can be achieved by cutting a hole in the center of a bath sponge and holding it in place with tape or a headband. Your dermatologist may prescribe topical nitroglycerin to improve blood flow to the area, which has been shown to significantly reduce pain and improve appearance. The lesion may also be surgically removed, though the rate of reoccurrence is high unless some other measure is taken to relieve the pressure that caused it.